Rachel and I celebrated our second wedding anniversary last week, so what better way to honor the occasion than by, you guessed it, going out to dinner? 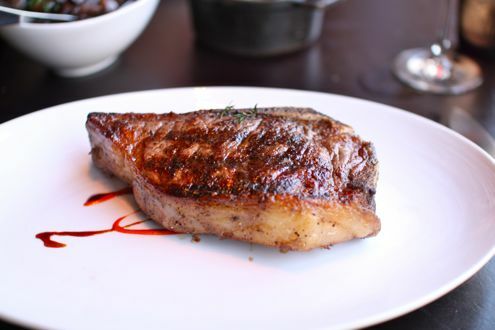 We headed out to BLT Steak as our friend had given us a gift card as a wedding present for said restaurant and felt that it was an opportune time to finally use it. 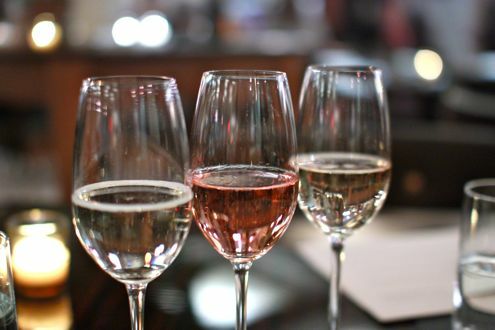 We started the evening off by splitting a sparking wine flight of prosecco, rose, and champagne between the two of us. 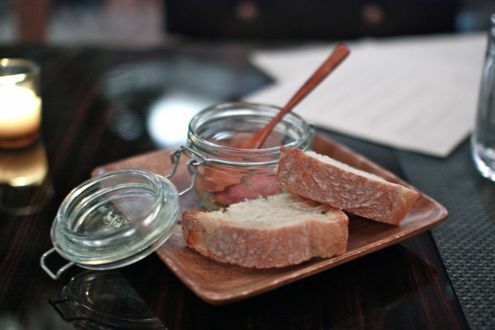 Soon after, we received a plate of crusty bread with chicken pate. The pate had some excellent consistency and certainly beats your typical spread of butter. 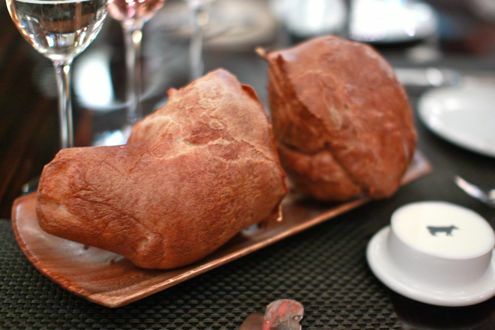 Then the restaurant’s trademark item arrived — their popovers. We have heard the stories and seen the images, but yeah, I’ll let the below shot speak for itself. Piping hot, I nearly singed my fingers trying to crack open this mammoth piece of bread. But the pain was worth the reward once I pried inside and started tearing away pieces. 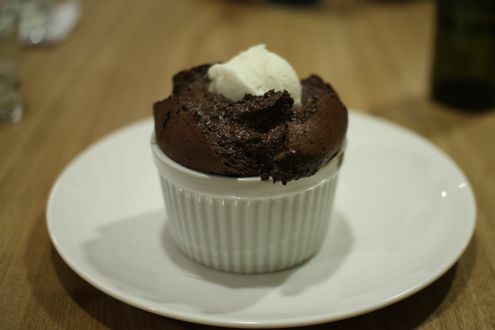 Warm and soft, the restaurant even provides you with a recipe so you can try to make them at home. 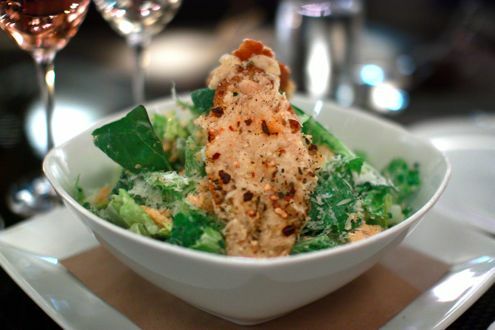 We decided to split their Caesar salad for our first course, and it’s a good thing we did since the portion is large enough to share between two people. 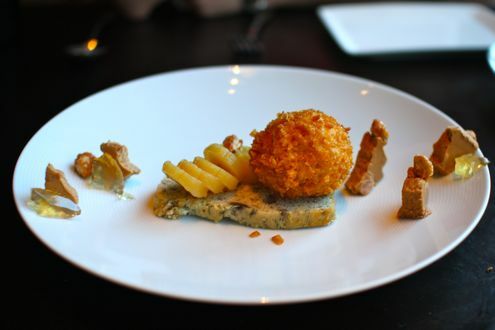 It was a unique presentation in that it is served with two giant croutons that you breakdown into smaller pieces. We also liked the fact that it wasn’t drenched in dressing yet wasn’t dry enough where you needed to ask for extra. Following in the tradition of our previous courses, Rachel and I decided to share their 12 ounce filet for our entree. Rachel preferred a medium temperature while I wanted mine medium-rare, so BLT was able to accommodate both of our requests by indicating as such when the steak arrived. You also have your choice of sauce to accompany the steak, so we went with the béarnaise and peppercorn (our waitress was kind enough to let us try both). The steak was excellently cooked as it had a subtle amount of char on the outside but melted in your mouth once you took a bite. It’s as simple as it gets – a dash of salt and pepper, then seared to perfection. I was very impressed by the tenderness as well as the flavor. 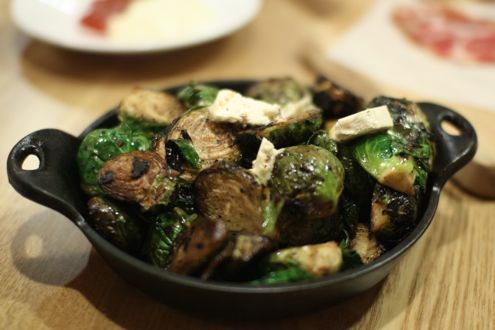 As for sides, we ordered the caramelized brussel sprouts with bacon lardons and truffle mashed potatoes. While we enjoyed the former, the latter was the more memorable of the two. 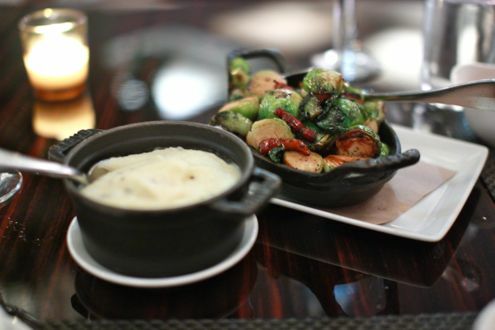 Not to make such a bold statement, but these were some of the best mashed potatoes we have ever had. Creamy and buttery, we were savoring each bite until the bowl was scraped clean. It only took us ten months or so, but we finally tried Medium Rare last week. 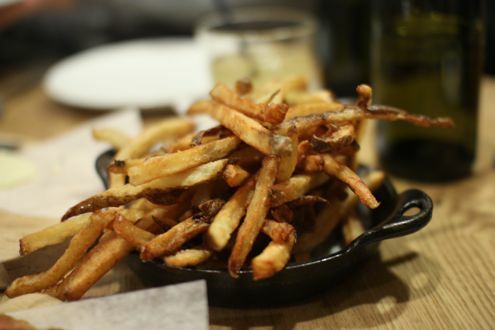 I can’t speak for Rachel, but I have been dying to try this place not only because of the simple concept, but plainly because I love steak frites. Turns out Medium Rare was designed with me in mind, and I greatly appreciate it. We were able to procure a table for four with ease on Friday night, but that’s also because we were having a 6pm dinner. Rest assured the place was nearly full an hour later. 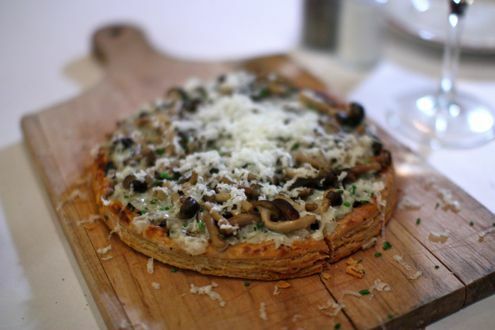 It’s amazing to think that Yanni’s Greek Taverna is where Medium Rare now sits, but this is a great addition to the Cleveland Park neighborhood. 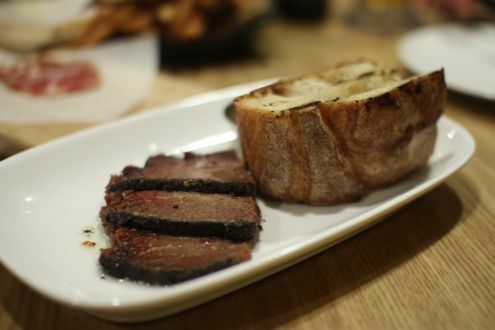 Helmed by Mark Bucher of BGR The Burger Joint fame, Medium Rare is the simplest of steakhouses – a prix-fixe menu of bread, salad, and steak & fries for $19.50. 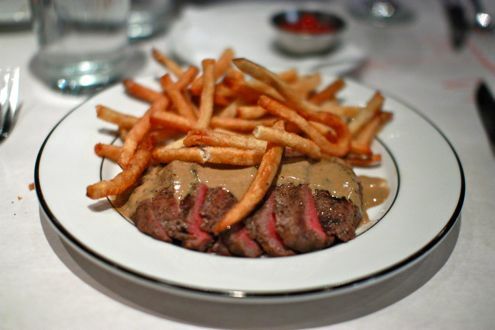 And yes, that even includes a second helping of their steak frites. For an entire meal under $20, it’s an incredible value. 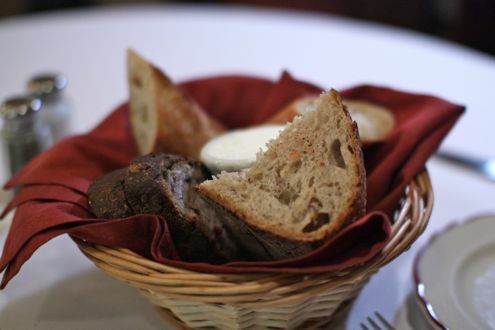 The artisan rustic bread was crusty on the outside, fluffy on the inside, and our waitress gladly refilled our basket once we had gone through the first batch. 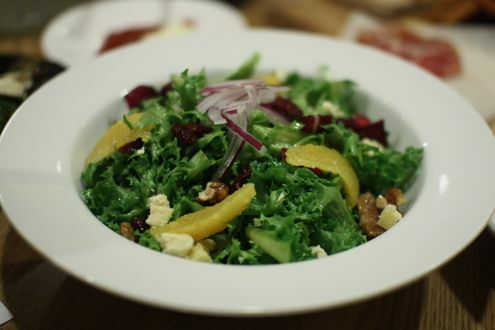 The mixed green salad, topped with cherry tomatoes and Dijon vinaigrette, soon came next. 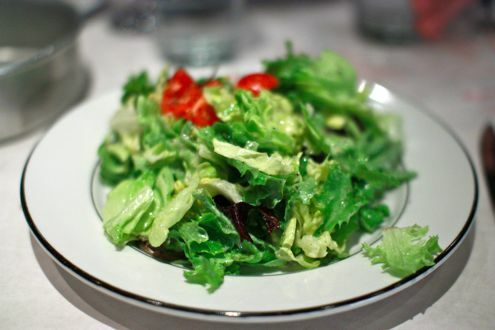 We all enjoyed the salad as the lettuce was crisp without being completely saturated in dressing. Then, it was time for the main event. 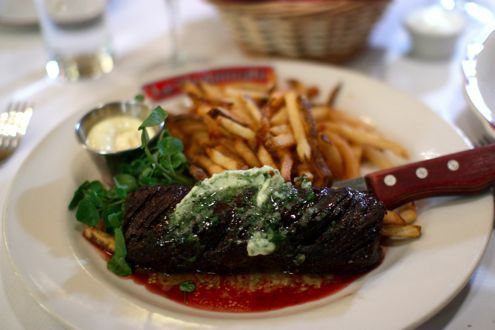 The culotte steak (top sirloin cap) was topped with the restaurant’s “secret sauce” and served with a generous heap of frites. The steak, just like the name of the restaurant, was cooked medium rare. 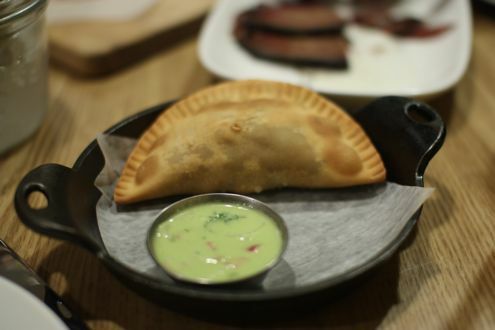 The thin, tender strips of beef were full of flavor, but the addition of the kitchen’s gravy/béarnaise concoction really got the taste buds flowing. Just as I had finished my plate, our server came by with a grillpan full of more steak and fries to distribute evenly amongst our table. Rachel was full by this juncture, but I happily had her seconds (are you honestly surprised?). 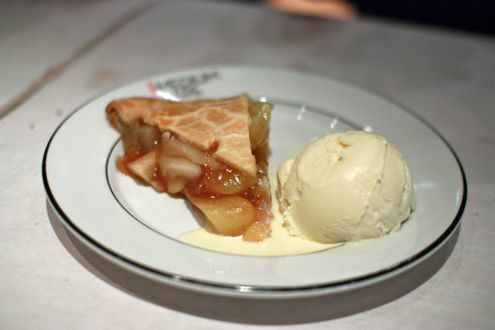 The four of us decided to split a dessert, so we went with the apple pie accompanied with vanilla bean ice cream. The pie was piping hot, flaky, and overflowing with apple. I especially enjoyed the ice cream as the vanilla flavor was very pronounced. 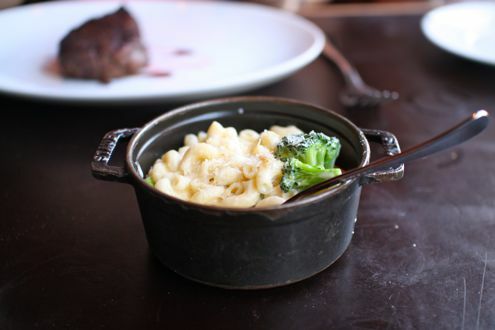 We had a great meal at Medium Rare, and it’s a terrific option for those not looking to break the bank. You’re not going to be getting a prime filet, but for the price, I was very happy with my steak. All and all, I would definitely come back, though you really have to be in the mood for steak frites since, well, it’s your only option. New Years Eve is perhaps the most overrated holiday of the year, so instead of dropping over $100 on one of those silly “open-bar” parties where the venues are overcrowded and short-staffed, we opted to go out with a few of our close friends for dinner instead. 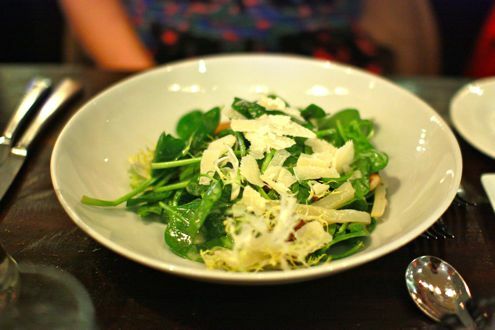 We ultimately decided on Ardeo which offered a four-course prix-fixe menu for a reasonable price of $65. Rachel and I haven’t dined at Ardeo since 2008, and it’s received quite the makeover since our last visit. Because we had a party of ten, we were seated at their “community table” – a long table which made conversation with the entire community just a tad difficult. I won’t blame that on Ardeo though, a round 10-top is typically found at banquet halls, not restaurants. 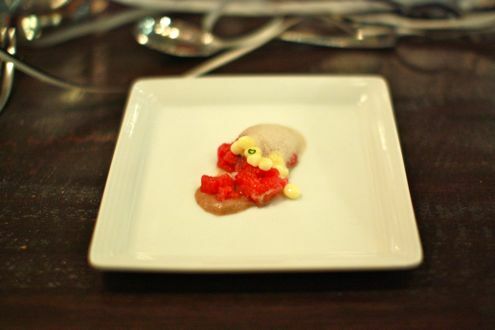 Anyway, the amuse bouche for the table was a beef tartar accompanied with egg “caviar” and black truffle. I liked the execution of the egg caviar, very clever. 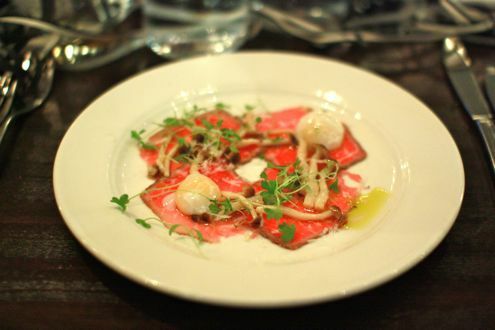 Diners had six options to choose from for their first course, so naturally I went with the beef carpaccio. 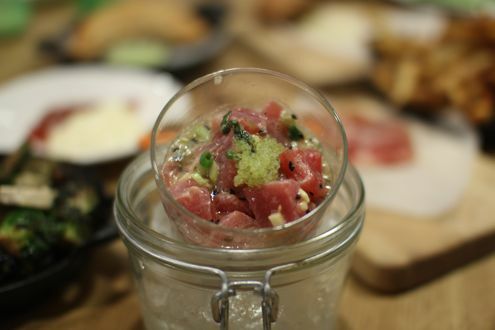 And yes, while I’m aware I just had the beef tartar moments ago, I’m a glutton for all things beef, so this decision was rather easy. 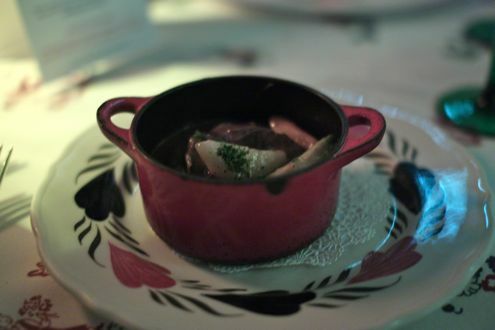 The four thinly-sliced pieces of beef were topped with a couple of 63 degree quail eggs as well as pickled brown beech mushrooms. 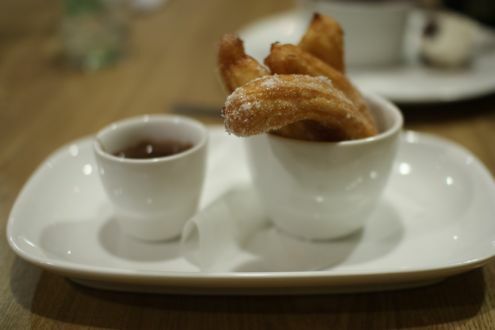 Lovely presentation and a solid first course dish. Rachel ordered the gnocchi salad, which was prepared with spinach salad, crisp gnocchi, braised fennel, and truffle vinaigrette. She thought it was a great first course. The gnocchi were a little different than what she is typically used to in that they were longer pieces, but they weren’t too heavy and you could definitely taste the truffle oil. For our main course, I ordered the seven hour braised leg of suckling pig. 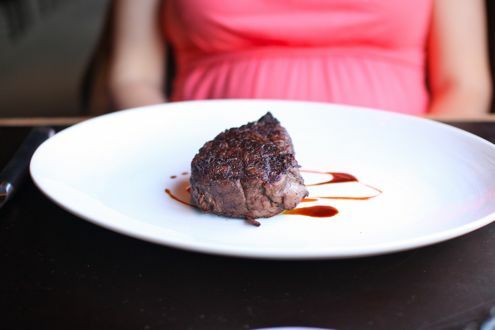 I haven’t had suckling pig since my 30th birthday at Komi, and while the grilled barrel-cut rib-eye caught my eye, I simply could not do a trifecta of beef in one sitting (… or could I?). 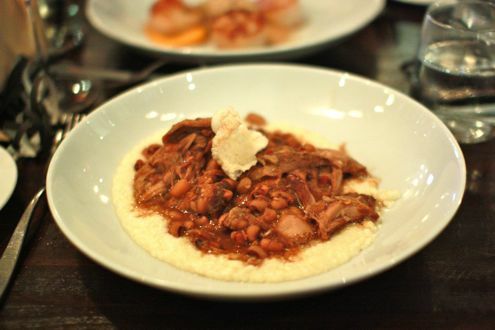 Back on topic, the pork was accompanied with cheddar grits, black-eyed peas, redeye gravy, and peanuts. It slightly reminded me of the Kalula pork we had in Hawaii, except the meat at Ardeo was dry in some areas and not as rich in flavor as its Pacific counterpart. It’s also a shame there that wasn’t any crispy skin included, but again, that’s Komi’s fault for taking this dish to the next level. I probably would have enjoyed Ardeo’s rendition more had Johnny Monis not completely spoiled me with his exquisite preparation. Rachel’s entrée was the Day Boat Scallops with a butternut puree, spaghetti squash, bacon, and a lobster emulsion. The scallops were charred nicely on one side, but as our friend Keith mentioned who had also got the same dish, they may have been better if they were seared on both sides. 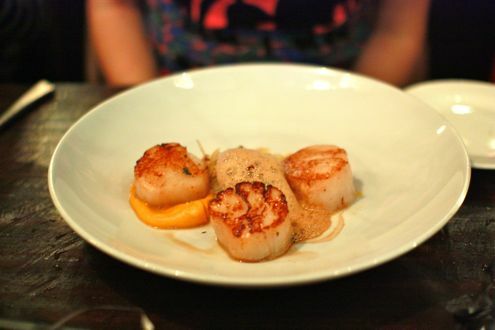 The best part may have been the butternut squash puree as dipping the scallops in it made them taste even better. The spaghetti squash added a nice texture to the dish, but she couldn’t really taste any lobster in the emulsion. For dessert, each patron received a trio of desserts. 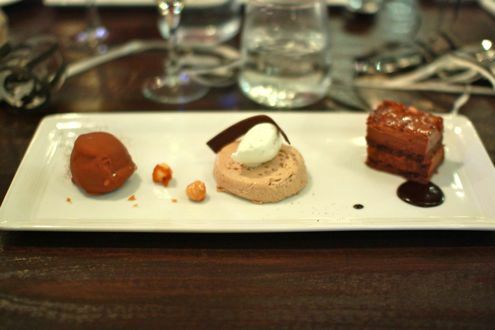 The first was a chocolate bonbon stuffed with vanilla ice cream and then dusted with more chocolate, the next was a coffee mousse, and the third was a chocolate-pistachio tart with salted caramel and a milk chocolate glaze. The tart was my personal favorite while Rachel favored the mousse. Because it’s not New Years Eve without some bubbly, our waiter came by with some complimentary glasses of champagne to close out the meal. While the service was slow at times, I have to tip my hat to the manager. When one of our friends thought her cod was overcooked, the manager sincerely apologized and asked if she would like to order a different entrée. Within minutes, she received a freshly-grilled rib-eye and was very pleased with it. Now that’s excellent customer service. When we received the bill, gratuity was not included which I felt was a little peculiar. Because we were such a large party, it’s often typical that restaurants include gratuity at a predetermined percentage, but apparently this was not the case for us. No matter, it just made splitting the check a little more time-consuming. 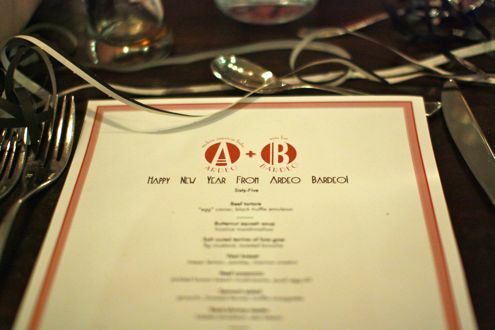 Overall, we had a great New Years Even dinner at Ardeo. Everyone had an enjoyable time and was satisfied with their meal. While restaurants are typically more expensive during the holiday, I felt that $65 was a fair price considering the quality and quantity of food we received throughout the night. I wouldn’t mind going back in the near future just to order from their regular dinner menu let alone their champagne brunch. I am very fortunate that my parents live only a few hours away up in New Jersey, and whenever they come to visit, they like to see new things in the DC area and go out to fun restaurants. Last week, they visited for my mom’s birthday and I decided that we should go somewhere in Bethesda that has a great reputation for quality food: Persimmon. 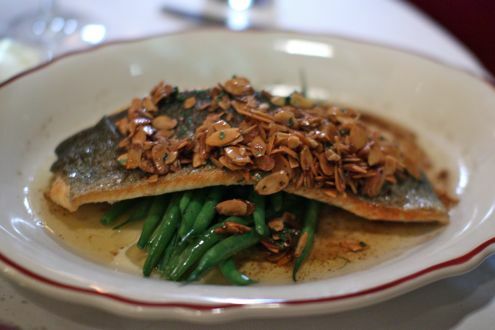 We have eaten at Persimmon several times for lunch but only during Restaurant Week. 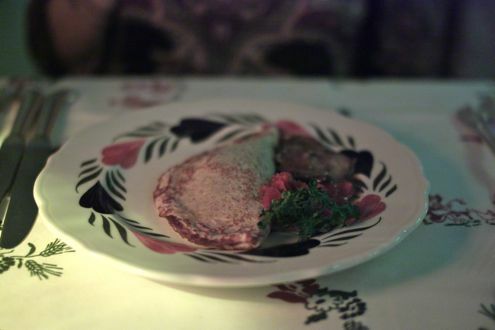 This was our first dinner experience off the regular menu, and we have to admit, we had some high expectations. 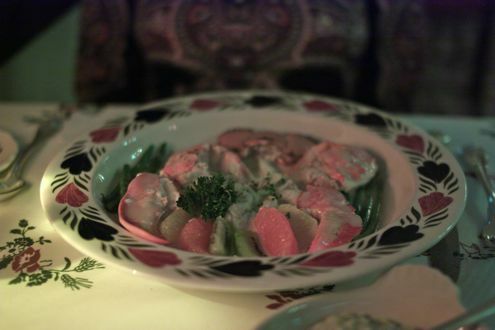 Tucked away on the edge of Bethesda along Wisconsin Avenue, it is easy to miss this unassuming restaurant. 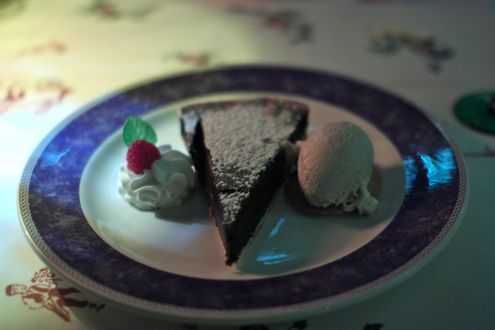 However, year after year, it earns high marks both from critics and diners, so off we went to see for ourselves. The only tricky thing about eating out with my parents is that my mom is strictly kosher and only eats fish when dining out, so I always make sure beforehand that there is enough on the menu for her to choose from. Unfortunately, there weren’t as many options as I had hoped for, but in the end, my mom enjoyed her meal as we all did. To start, we ordered a bottle of Bex Riesling. I had first learned about this label from my friend Lisa and we really enjoyed it as a light and crisp wine. We all shared the smoked trout spring rolls and the roasted beet salad as starters. 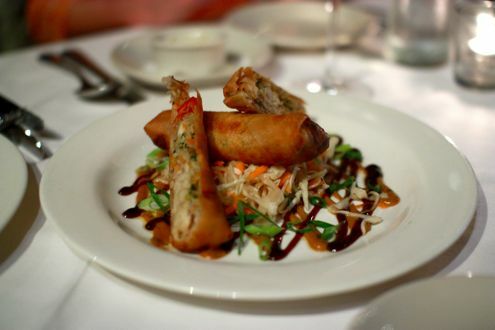 The spring rolls were accompanied with hoisin barbecue and peanut sauce and paired well with the trout due to the appetizer’s smokiness. It was a dish that I wasn’t sure would work from the description, but it definitely did. Meanwhile, the beet salad consisted of roasted beets, arugula, blue cheese, apples, walnuts and a lemon poppy seed vinaigrette. 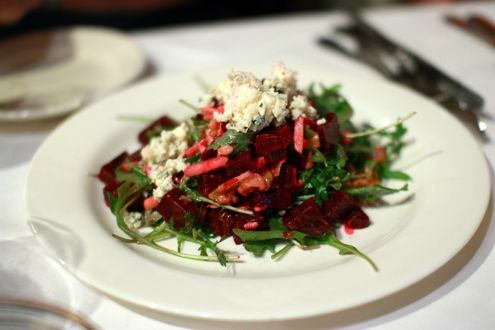 It was a beautiful fall salad and a nice starter to the meal. For our entrees, my mom ordered the salmon, which was served with artichokes, mushrooms, and a basil risotto. The salmon was perfectly cooked while the risotto was so delicious that it could have been a meal in itself. 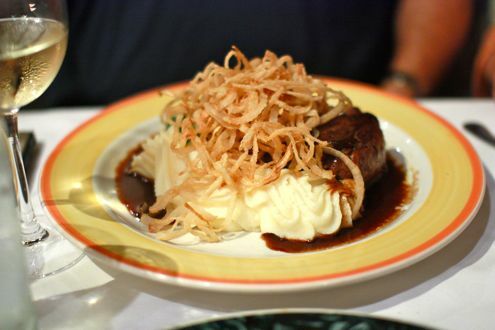 My dad got the beef tenderloin with mashed potatoes, spinach, and fried onions. It seemed like a very conventional dish on paper but that didn’t mean my dad did not devour his plate. I went with the pan-seared rockfish, which was accompanied with shrimp, zucchini, exotic mushrooms, crispy polenta cake, and a lobster beurre blanc sauce. There was a lot going on in this dish, but somehow it all worked. 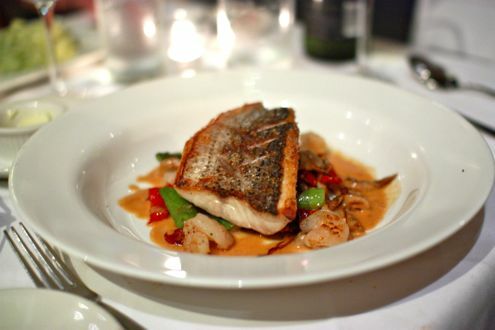 I really enjoyed the rockfish and it was fun mixing all the flavors together in the dish. The sauce was very salty, but overall, I really liked all the components both apart as well as together. 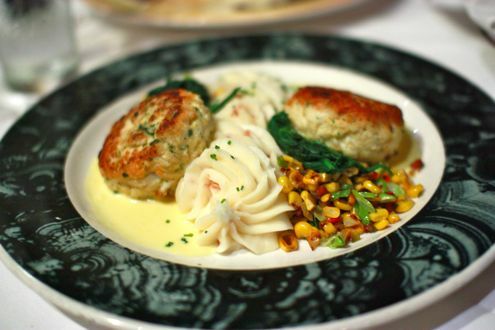 Brett went with the sautéed lump crab cakes with bacon mashed potatoes, roasted corn hash and a sweet corn sauce. While it was an adequately-sized portion, the crab cakes were rather ordinary as they had a bland flavor and lacked the lump meat consistency that we’ve found at other restaurants (see Jerry’s Seafood). On the flipside, he really liked the roasted corn hash and sauce as it was a nice complement to the crab meat. 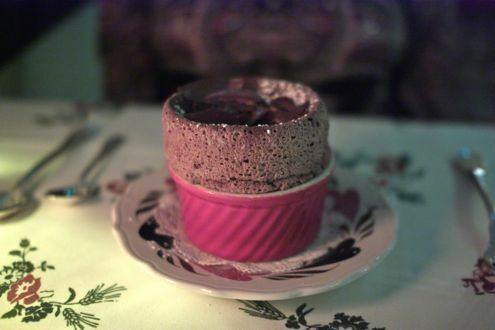 While we were very stuffed at this point, my dad ordered a crème brulee for my mom, which we all happily shared. All in all, it was a terrific meal that did not disappoint. 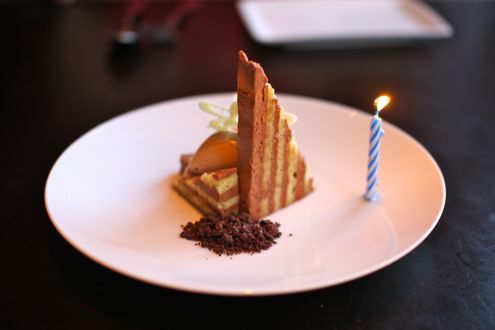 We also noticed that Persimmon offers a sunset dinner special that features a three-course menu for only $30. The only caveat? It’s offered Sunday through Wednesday from 5pm to 6pm. We’ll definitely have to take advantage of that deal at some point. 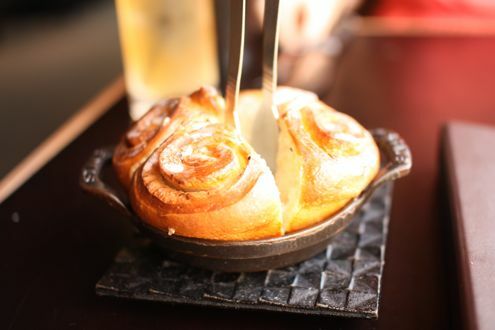 We have also been eying their brunch for some time, and if our dinner was any indication, it will definitely be on our list to visit again soon. 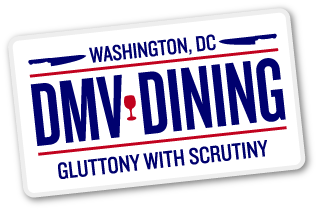 Not only was it just a year ago that DMV Dining launched, but around the same time, OpenTable debuted Spotlight, their Groupon-like website. 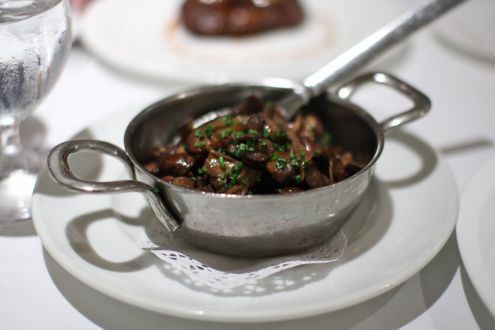 Their very first offer was for Charlie Palmer Steak, and naturally we took the bait. 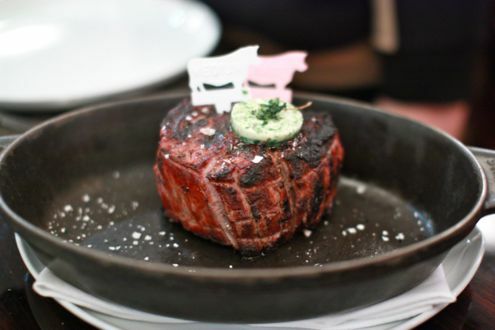 Needless to say, Charlie Palmer was (in our assessment) Spotlight’s most enticing offer since they launched, as the restaurants since then have not quite matched the caliber of the Capitol Hill steakhouse. We were able to book a reservation for Friday evening, and wouldn’t you know it, the restaurant offers free corkage on Fridays! This was purely coincidental when we originally booked our table, but upon finding out the news, we brought along a bottle of King Estate’s Acrobat Pinot Noir. When we were seated, the waitress poured two glasses of the wine we brought and soon returned with an amuse bouche of rock shrimp ceviche. It provided some excellent flavor for such a small bite and was a nice way to start off our evening. 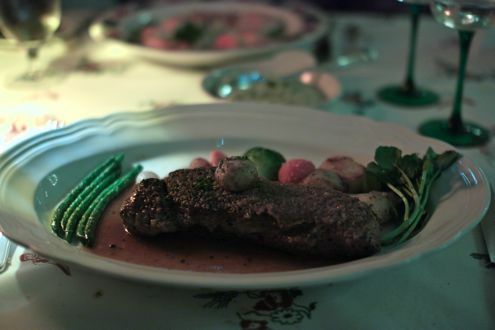 For our entrees, we kept it rather simple: we both ordered the European cut filet, Rachel opting for the petite size while I went for the standard portion (surprise, surprise). 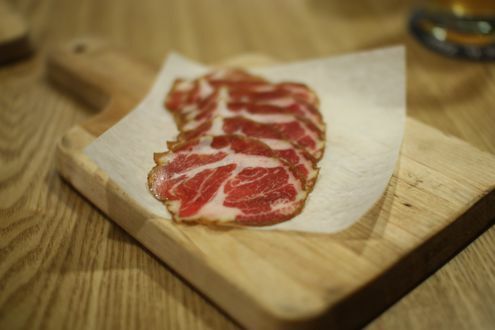 The quality of the meat was exceptional as it was evenly cooked and deliciously succulent. Not to throw Grapeseed under the bus, but the difference was night and day between the two restaurant’s steaks. 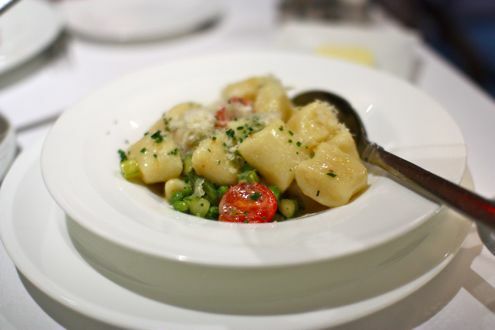 Following the advice of EatMore DrinkMore’s Jenna, we ordered the Parmesan gnocchi as one of our sides. Folks, this could have been a meal in itself. For eight dollars, we had more than enough pasta to share between the two of us. Oh, and it was really, really good. 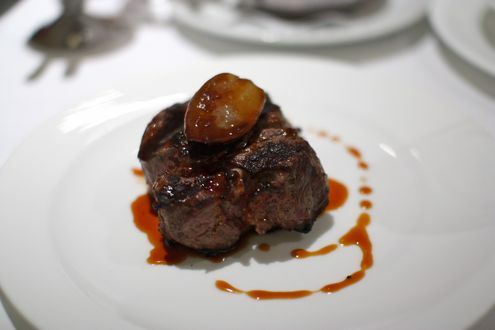 It was such a clever way to complement the filet rather than serve it with your typical baked potato or order of fries (though the ones at Charlie Palmer did look delectable). 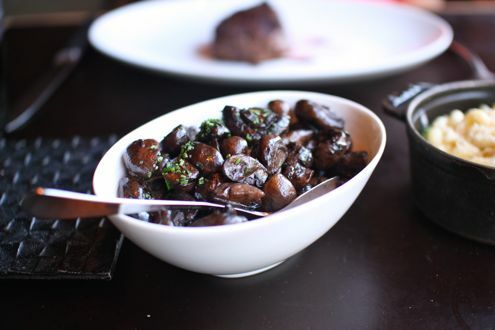 We also ordered a side of wild mushrooms and onions which we both really enjoyed. Nothing really to write about here, but the garlic nicely supplemented the filet. 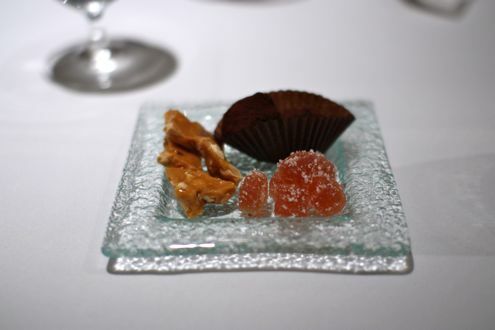 We didn’t wind up ordering dessert as we were both so full from our meal, but then the waitress brought over a small assortment of bite-sized treats which included peanut brittle and chocolate truffles. Unsurprisingly, they were gone within seconds. Overall, we both really enjoyed Charlie Palmer. Our waitress was very friendly, topping off our wine glasses the moment they were no more than a third full. Meanwhile, the food was fantastic. I was very impressed by not only the cuts of the filet, but also by the superb gnocchi. It’s been awhile since I’ve been to Ray’s the Classics, but Charlie Palmer is right up there as one of my favorite steakhouses in the DMV. After years of living in Bethesda, whenever someone has asked for recommendations of nicer places to eat, I generally think of Grapeseed as an obvious choice. We had been there several times for dinner, mainly for Bethesda Restaurant Week, and have always enjoyed our meals there. Earlier this year, we had purchased a LivingSocial deal for Grapeseed and were finally able to use it before it expired. We arrived early for our reservation hoping to be seated, but they were still busy so we got a drink next door at Freddy’s Lobster and Clams, Chef Heineman’s new venture and one of our new favorite spots in Bethesda. After some tasty beers we made our way back and were seated by the front of the restaurant. It was nice to be able to see the full menu rather than a limited Restaurant Week one. One thing I noticed right away was that some of the dishes that stood out on the “sample menu” on the website were missing. 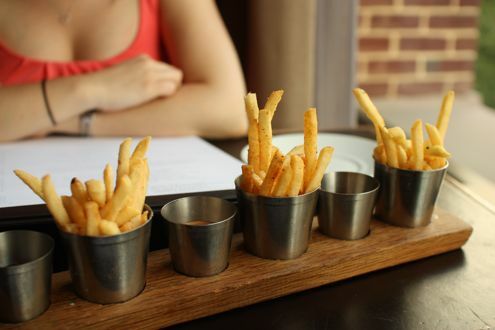 I understand that many restaurants do this to only show a taste of what they offer, but I had to change my game plan and it threw me off a bit. We already had some drinks so we appreciated that you could order half glasses of wine, so we each ordered based on the sommelier’s recommendation on what to pair with our entrees. 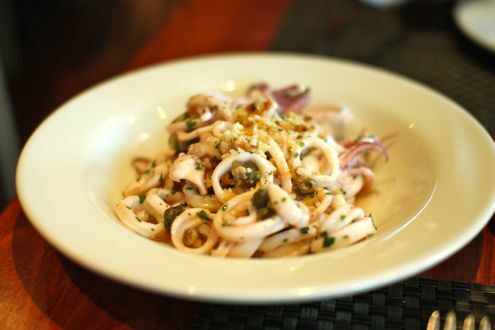 To start, we shared the sautéed calamari. I’m a sucker for grilled or sautéed calamari (as opposed to the fried stuff), so we had to try it. 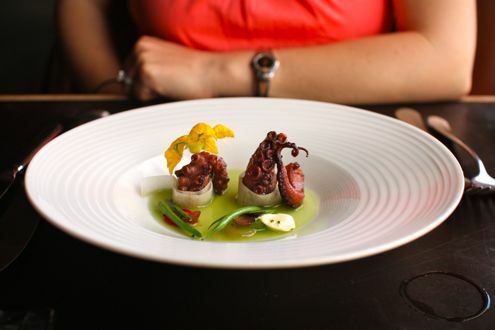 I enjoyed the lemon and caper flavors but the calamari rings themselves were fairly thin and limp. I guess I’m used to calamari when it is the thick tubes you have to cut, not the smaller rings. It was still a nice dish, but I’ve had better. 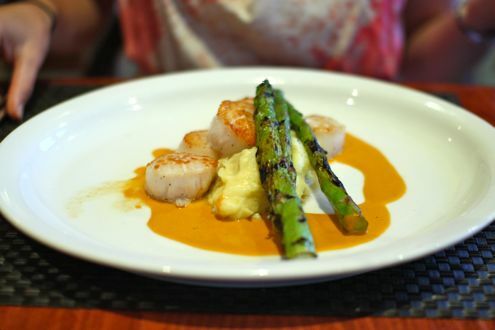 For the main course, I opted for the scallops that came with a lobster sauce, asparagus, and curried mashed potatoes. Overall I liked the scallops, but the lobster sauce was too salty for my taste and it in turn made the seafood taste overwhelmingly salty. 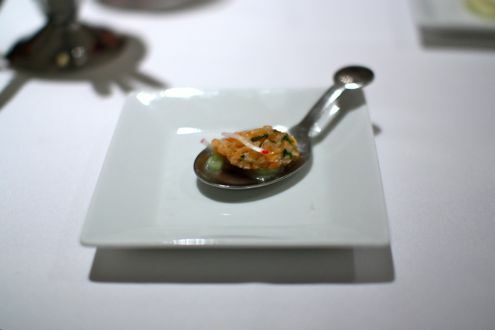 They were definitely generously-sized scallops, but something was lacking in the dish overall. Interestingly enough, the dish listed on the “sample menu” came with roasted cauliflower and mustard greens as opposed to the asparagus and potatoes that I received. I’m not sure when it was changed but I’m wondering if it would have been better if I had tasted the dish as it was originally intended. 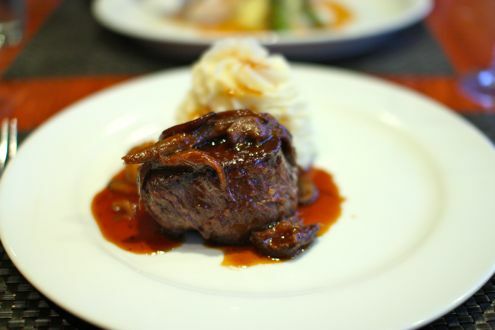 Brett ordered the pan-roasted filet with horseradish mashed potatoes with an oxtail-mushroom ragout. Just like scallops, he thought the filet was good, not great. He ordered it medium rare, but it was unevenly cooked and just wasn’t as flavorful as anticipated. Meanwhile, the mashed potatoes were something we could have made at home and were a tad dry. Brett was also surprised how there wasn’t any sort of green found on the plate. Granted, you can order a side of mustard greens (for $7.50), but this was strictly a meat and potatoes dish that really needed a vegetable. Overall we were slightly disappointed in our meal at Grapeseed. It’s not that we had bad service or the food was horrible, but it just didn’t wow us in the way it has in the past. We met a nice couple next to us who had never been before and they too were underwhelmed with their dinner. Maybe we were just there on an off night. Maybe we’re just tougher critics than we were when we last dined here years ago. I’m sure we’ll be back again, but I think we’ll be sticking to Freddy’s over Grapeseed.